Former Brexit Secretary Dominc Raab blocked LBC radio presenter for tweeting a video critical for him. “Always flattered to be targeted by the Looney Left, James, but you can take your anti-Brexit rants and your student politics elsewhere – you’re blocked,” Raab tweeted to James O’Brien. In one clip, Raab said he didn’t support the Human Rights Act or “believe in economic or social rights”. In another clip, Raab is told by a member of the public that the work capability assesment kills people. Work capability assements are supposed to test if people claiming disability benefits are able to work or not. They were carried out by private companies like Atos and Maximus and many of their decisions to declare people ‘fit to work’ were wrong, with around 40% of appeals succesful. According to Department for Work and Pensions figures, over 2,000 people died within weeks of being declared fit for work and having their social security payments cut. The Trussel Trust handed out 41,000 food packs in 2009/2010. By 2016/2017, this had risen nearly 3,000% to 1,200,000. The latest Trussel Trust data says that ‘low income’, ‘benefit delay’ and ‘benefit changes’ are the most common reasons people are referred to food banks. Rabb’s view of food banks has been echoed by other Conservatives. Jacob Rees-Mogg described support for food banks as “rather uplifting” and Theresa May said there were “many complex reasons” why people go to food banks. 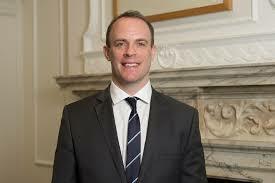 Raab also admitted he had not read the Good Friday Agreement in full and had not realised the UK’s trade was so reliant on the Dover-Calais crossing. There is a danger in focusing on one particularly vicious version of Rik Mayall’s Adam B’stard. The Tories since 2010 have constantly attacked the welfare state, NHS and the poor and disabled and for five years were enthusiastically supported by the Liberal Democrats. Raab can be confident that is views will not be criticised by large sections of the press. Well done James O’Brien for exposing the rank hypocrisy of Raab, the immigrant-hating son of an immigrant.